San Ramon police officer involved in a motorcyle accident is seen near Brentwood, Calif. on Thursday, April 26, 2.18. 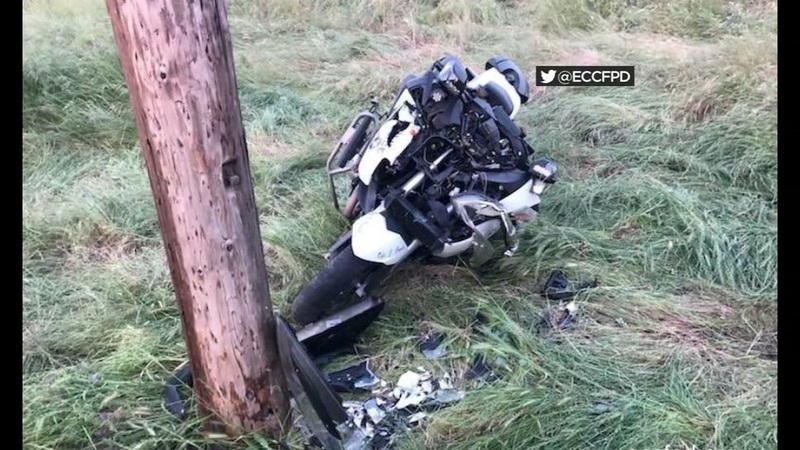 CONTRA COSTA COUNTY -- A San Ramon police officer was taken to a hospital early Thursday morning after he crashed his motorcycle into a telephone pole in Contra Costa County just south of Brentwood. responders were called to Deer Valley and Chadbourne roads at about 5:30 a.m. The male officer suffered moderate injuries and was flown to a nearby trauma center, fire officials said. "It could have been a lot worse," Carlson said. The investigation is still in its initial stages and Carlson said the officer was on his way to work when he crashed into the tree. Carlson said there is no indication that drugs or alcohol were involved in the crash.